For most of us, filing our tax return is as scary as finding the monster hiding in the closet which we know exists but avoid facing unless really necessary. Xiaomi understands your pain and has added a bunch of features in the Mi Calendar app that will help you punch the monster away. Xiaomi has partnered with ClearTax to help you clear away your tax voes. If you own a Xiaomi device running MIUI, you can utilize the useful feature to file your income tax return seamlessly. To start with it, head over to the Mi Calendar app in your Xiaomi smartphone. You’ll land onto the July page. 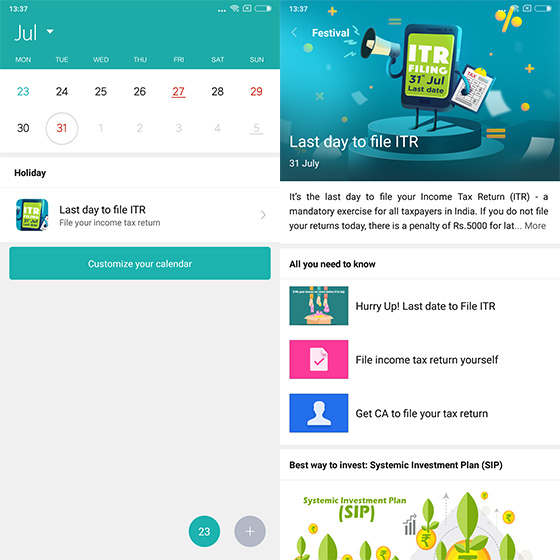 Tap on July 31, which is the last day of filing the return and you’ll see an option saying “Last day to file ITR”. Tap on the option to open a page-full of options and resources. On the page that pops up, you’ll see a few suggestions and some resources on filing returns without a sweat. Basically, these are links to guides that will help assist you in filing the return. The first one leads you to a blog page which gives you an overview on how to file the ITR. 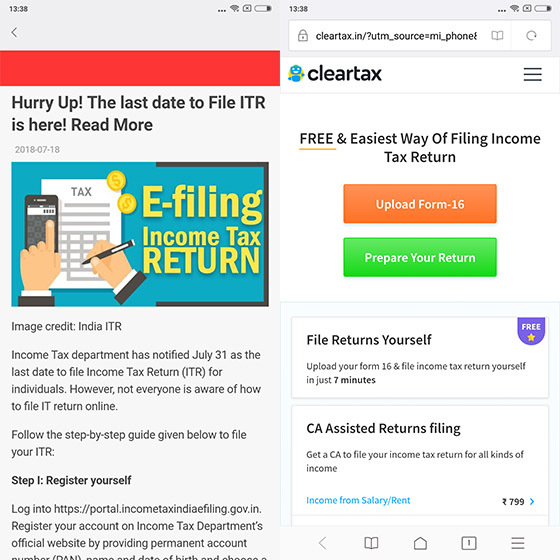 The other two links direct you to dedicated pages on ClearTax – one of which will help you file ITR with the help of an assistive tool while the other will help you choose services of a trained CA, so you don’t even have to even take the pain of filing the returns yourself. The page also helps you with resources like guides on Systematic Investment Plan (SIP) and other Cleartax blogs such as the “Benefits of Filing ITR”, how to “File without form 16”, and “Start a tax saving SIP”. Once you’re done saving tax, Xiaomi suggests that you use this money to buy Xiaomi smartphone accessories including the Mi Power bank, Mi Band, and I❤Mi T-Shirt. 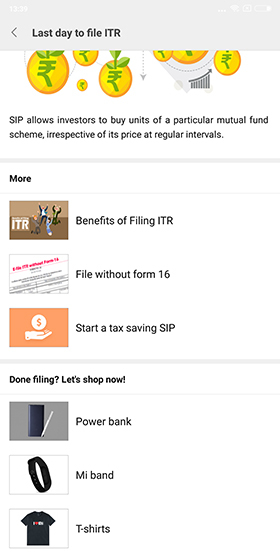 While this is a very simple integration, Xiaomi ears brownie points for making an effort trying to help its users remember the criticality of filing the tax return. Being late can earn you a penalty of Rs. 5,000. So, be quick and file your tax returns, if you haven’t done so already, and feel blessed for having a Xiaomi smartphone.